The measles outbreak at Disneyland, December 2014, prompted a frenzy of public and media attention to the hyperbole of the vaccine-autism debate. Politicians, both democratic and republican, waded into the debate to give their opinion- much to the alarm of scientists and physicians. Most concerning to health officials, was that the pundits, by irresponsibly reporting fraudulent studies and the “opinions” of politicians and celebrity activists, gave the thoroughly debunked “Vaccine-Autism theory” a relevance that it doesn’t deserve. Unfortunately, the consequence has been that significant numbers of parents have delayed or refused the vaccine. The origin of the Vaccine-Autism theory started with a 1998 article in the Lancet, a peer- reviewed medical journal that linked autism and vaccines written by a British physician, Andrew Wakefield, along with a dozen other co-authors. The title of the paper:”Ileal-lymphoid-nodular hyperplasia, non-specific colitis, and pervasive developmental disorder in children”, was not the larger than life title that would have grabbed the attention of the mainstream media. It also would not have clued in parents who may have been confused, concerned or on the fence with vaccinating their children. The study was based on a dozen kids who developed intestinal and behavioral problems. Eight of the 12 had been vaccinated with the Measles, Mumps, and Rubella vaccine. Soon afterward, the parents reported that behavior changes took place in their children after they received the vaccine. Wakefield and his co-authors then took biopsies of the colon and reported that several of the children had non-specific colitis and hyperplasia of the Ileum of the colon. Wakefield and his co-authors concluded, therefore, that there may be a possible link with the intestinal disorders leading to neuropsychiatric disorders after administration of the MMR vaccine. A press conference and video news release of the study was all it took to spark a backlash against the MMR vaccine. Soon celebrities, such as Jenny McCarthy, and other high profile anti-vaccine advocates jumped on the bandwagon to launch an anti-vaccine crusade, furthering a world-wide scare of vaccines. The events triggered a decline in immunizations, an increase in MMR outbreaks, and the anti-vaccine movement pushing full speed ahead. Between 2003 and 2011, a British investigative reporter, Brian Deer, best known for his investigations into science, medicine, and social issues for the Sunday Times of London, investigated the vaccine-autism connection study in the Lancet. Deer published his findings of the study in the BMJ medical journal. According to a BMJ 2011 editorial, Deer discredited the study alleging a conflict of interest through Wakefield’s involvement with a lawsuit against the vaccine manufacturers and manipulation of the data. Unfortunately, there was not a direct correlation with the retraction of the study and public confidence in vaccines. According to a CNN report on the retracted study, a sharp drop off in the vaccine rate in Britain, as high as 80% by 2004, occurred after the Lancet published the study as parents panicked. The vaccine rate never seemed to recover fully even after the story was discredited as parents continue to blame vaccines for their child’s condition. Why is there continued mistrust? Today, the number of measles cases has dramatically increased, especially for a condition that was once largely eradicated. Recently, the organization Autism Speaks, discussed on their website that a large scale 2015 study, reported in the Journal of the American Medical Association (JAMA), of over 95,000 vaccinated children including 15,000 unvaccinated children and children already at high risk for autism, that there was no link with the MMR vaccine and autism. 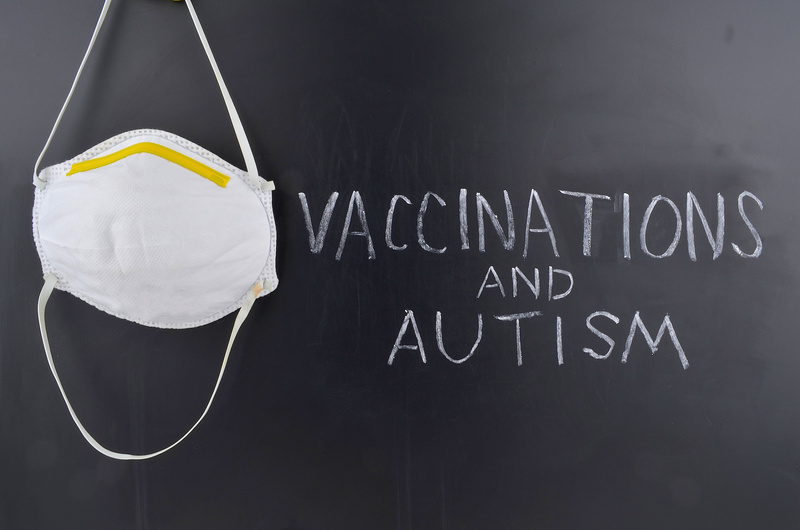 The study found that autism rates were actually lower in the vaccinated group. So why do parents still mistrust vaccines? The most logical explanation is that infants start vaccinations during a period in their life when rapid developmental changes are happening. Once a child misses an important developmental milestone, which naturally would be after initiation of multiple vaccines, parents assume causation. What is interesting is that the Vaccine-Autism theory has changed multiple times over the years. First, Autism was linked as a direct cause and effect from vaccines originating from an intestinal reaction after the Wakefield study. Next, it was due to the preservative, Thimerosal. After Thimerosal had been removed from childhood vaccines, it switched to the vaccine schedule itself. Fast forward to December 2014 at Disneyland. An infected person creates a measles outbreak at Disneyland which then spread to several states and left over 100 people infected. The outbreak illustrated just how rapidly these once common childhood diseases can spread. As of April 24, 2015, 166 people were already infected in 19 states. According to the CDC, “Measles can cause serious health complications, leading to pneumonia, encephalitis (swelling of the brain), and death”. The symptoms of measles start with a cough, sore throat, runny nose, red eyes, followed then by a rash that spreads all over the body. Measles is so highly contagious that over 90% of the people who are not immune and come in close contact with an infected person will come down with the disease. According to a 2014 CDC report, with the low vaccine rates, large numbers of children were at risk of losing what is known as herd immunity. Herd immunity occurs when enough people are vaccinated to protect those who have not developed immunity- those too young or too sick to be vaccinated, or those who have refused the vaccine. To achieve herd immunity 90-95% of the population needs to be vaccinated to afford protection in the population. Unfortunately, Herd immunity can be fractured. Herd immunity won’t protect people who are not vaccinated if the number of vaccinated falls low enough. With conditions that are highly contagious, such as measles, it wouldn’t take much to tip the scales toward an epidemic. The solution? As practitioners, we need to be careful how we communicate with people who are siding with the anti-vaccine movement. It’s counterproductive to shame them in social media and on national T.V. by calling them selfish, stupid or uninformed. Not to mention politicizing the debate is only making things worse. It stirs the pot and causes others to view the anti-vaccine message as mainstream. It’s kind of like bad publicity eventually is good publicity for all the wrong reasons. It fails to deliver constructive information and only leads to confusion. The result is people dig in further. How should a physician address concern? Personally, I would think that a shared decision- making approach or taking the time to dispel myths would be the way to best deal with vaccine-wary parents. Surprisingly, research shows that when physicians used a more matter of fact approach to vaccinations, they got much better results. The physicians who told parents exactly what vaccines their child would be getting that day without inviting any discussion saw more than 70% of the parents vaccinating their children. Instead, the physicians who were flexible and invited parents to discuss their thoughts on vaccines resulted in a whopping 83% declining vaccines.